show, in this case, the 2013 New York Auto Show. Well, the CLA45 AMG’s debut has now been confirmed for New York, via an entry form for a competition announced onMercedes' Facebook page. 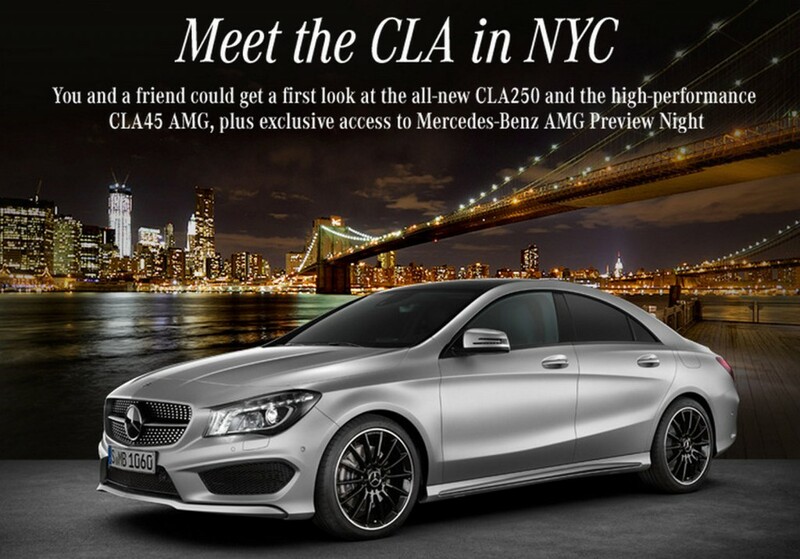 The competition gives you and a friend the chance to attend the unveiling of the regular CLA as well as the CLA45 AMG at the 2013 New York Auto Show, which kicks off on March 27. Both the CLA45 AMG and the similar A45 AMG will feature turbocharged and direct-injected 2.0-liter four-cylinder engines. The engines will be rated at close to 350 horsepower and will send drive to all four wheels via a seven-speed dual-clutch transmission. There will also be a sports suspension setup with independently developed front and rear axles, electromechanical AMG speed-sensitive steering, and uprated brakes and tires to ensure the cars can make the most of their explosive powerplants. wearing the AMG badge. Expect 0-60 times of around 5.0 seconds or less. With the regular CLA's pricing starting at $30,825 (including destination), expect the AMG model to command a hefty premium over that. For an early look at the new 2014 Mercedes-Benz CLA45 AMG, click here for ourprevious spy shots post. Can't wait for the 2013 new york auto show to finally get complete details on the AMG 45 CLA. Mercedes will have to make it good and price it right to make sure people can justify buying it over other performance sedans around it's price, in it's class, comparable, etc. Has the AMG MPG numbers been released yet?